Save $100s On Designer Fees & Create Stunning 3D-Realistic Covers For Your Digital Products In Just A Few Clicks! Get Instant Access Premium Quality Graphics, eCovers, CD & Software Boxes And Much More! Are You Tired Of Spending A Kings Ransom Every Time You Need Graphics For A New Website Launch? Have you bought custom mini site graphics for your websites in the past for $150 a set $250 a set or EVEN $350 a set? Would you like to finally be free of these high prices once and for all and be able to create your own graphics -with no experience- with a simple to use system? 3D Cover Action Scripts is that system... read on for all of the details! The purpose of this site isn't to hype you up into buying the newest "trendy" marketing course or anything like that. In fact, what I'm going to do is show you how to SAVE money on one of the most expensive things that we as marketers need. This is something that's absolutely required equipment when it comes to operating an online business if you want to achieve your maximum potential sales. I'm referring to graphics for your website of course. It's no secret that a website with a professional eCover, software box, DVD cover box and other "shiny" graphics sells more product. This is a tested fact that has proven true in every business that I have ever run. When I have gone back and added graphics to a product that didn't previously have them, the sales instantly went up within the hour. "Why Are Graphics So Important To The Success Of My Digital Product Business On The Internet?" People want to have a physical image of the digital product that they are purchasing in their head to make it "real". That's right, even though the product is digital and downloaded to their computer they need convincing of the tangible nature of the product. For example, if you are selling an eBook, you will close tons more sales if you plant an image of a "book" in the mind of your potential customer. That simple image gives them a visual representation which also adds more value to the product making it easier to purchase. You have to remember that everyone's minds revolve around what they can "imagine" so imagining it for them by having a pretty graphic or graphics on your website is essential. By eliminating the need for the potential customer to try and picture what it is that they are buying, you eliminate that road block and will bring in many more sales. "How Can I Get High Converting Graphics Without Getting Overcharged, Ripped Off Or Worst Of All... Delivery Of Bad Quality Graphics?" This is a pretty dark area to dive into because it's such a big problem. You'll find that there are a ton of options out there as far as designers that will create graphics for your website but they do it at an astronomical rate. I'm not just talking $50 for an eCover graphic, I'm talking $100-$200. Worst of all, they don't even give you the source files for the graphics so if you ever need to make any changes you have to go back to them and PAY them again! 1) The graphics that you are going to get are going to be of sub par, cut rate quality and will actually make more people NOT buy rather than buy! That's right, they can actually do more damage than not having any graphics at all! 2) The designer will leave you out in the cold & tell you tough luck leaving you to deal with the bad graphics while also keeping all of your hard earned money. Neither of these are very enjoyable experiences, let me tell ya' because I've been through both of them in the past. Simply Point & Click Your Way To Conversion Crunching Graphics That Make People Excited & Enthusiastic To Enter Their Credit Card Number & Click The "Order" Button! This is NOT another one of those Generator software applications that create graphics that never look very good or always look like someone "slapped them together". These are professional action scripts that you use in Adobe Photoshop to create graphics automatically. In fact, these are exactly what your graphic designer has been using to create your graphics that he or she has been charging you out the wazoo for! These designers usually have 3 or 4 of these action scripts that they use. There is also a person who sells a package of a dozen or so action scripts and charges $127. And that's just for a dozen or so action scripts! • 20 Professional Action Scripts To Make Creating eCovers As Easy As Pie! • Detailed Video Training With Our In House Graphic Expert To Show You EXACTLY How To Use Everything! • Caring & Prompt Support Available For You! Just Submit A Ticket And One Of Our Knowledgeable Support Reps Will Get Back With You! • Unmatched Product Quality! We Personally Hired One Of The Most Experienced & Most Expensive Graphic Designers To Design These Scripts Using Sound & Stable Design Techniques! That Means They Work Smoothly! 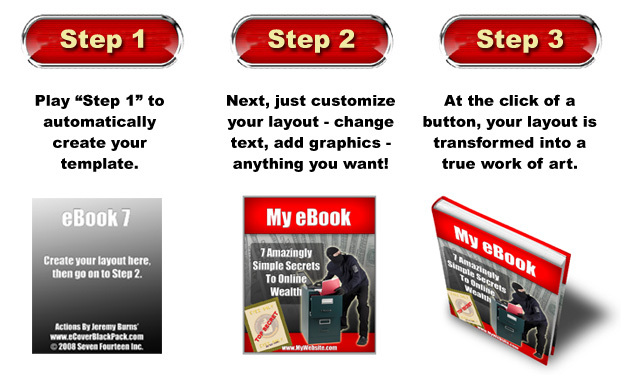 • Graphics That Convert More Sales! The Graphics That Your new eCoverBlackBack.com Package Gives You Will Convert More Of Your Visitors Into Cash Paying Customers Guaranteed! • Unlimited Site License With No Restrictions! You Can Create As Many Graphics As Your Heart Desires With Our New 3D Cover Action Scripts Without EVER Paying Another Fee. Best Of All You Can Create Graphics For OTHER People And Sell Them For A Profit! • Peace Of Mind! With Our Package You Have The Peace Of Mind Knowing That You're Dealing With A Reputable Company That's Been Around For A Long Time! We Are Going To Be Here Forever To Support You, Update The Package & Provide Ongoing Personal Care! This is ALL included with your 3D Cover Action Script Package! If this isn't enough, I'm going to get you so excited and worked up by showing you all of the awesome action scripts that you are going to get in this package. You will get to see all of the cool and profit producing graphics that you will be able to create with just the click of a few buttons! Creating Your Own Mini-Site Graphics That Look Like Those Of "The Super Gurus" Is Now Within Your Reach! In Fact...it's as easy as Pie! A Totally Simple System For Creating Your Own Website Graphics With Maximum Sales Potential To The Tune Of Thousands Of Dollars A Month! Create Mini Sites Without All The Complicated & Expensive Fluff That Other Systems Contain And Without Spending Hundreds Of Dollars On Outsourcers! Create Graphics For All Of Your Websites! Obviously, the first and fastest thing to do is add graphics to all of your websites using your new action scripts package. Just download your action scripts and you're off to the races creating graphics forever! Sell Graphics To Other People! As you get comfortable using the 3D Cover Actions Scripts, you can also create graphics for other people and sell them this service at a premium price! Think about that! Collect high graphic design fees without even being a graphic designer! Do A Yearly "Upgrade" To ALL Of Your Websites! This is a big benefit that most people just don't think of doing (mainly because of the cost). Do a complete overhaul on your websites every year by creating new, updated and fresh graphics to keep your business "up with the times". Can you imagine how much more money your sites would make every year with new graphics? Just Save Money! If all you did was create ONE set of graphics for your website using the 3D Cover Actions Scripts package your purchase has already paid for itself! Every other graphic you create OR sell is just additional savings and profit! Increase Orders With Graphic Bonuses! Think about this for just a second... If you gave your best customers a free set of graphics created in just a few minutes with your 3D Cover Action Scripts, do you think they would purchase even MORE products from you? No doubt that they would! This is a great way to get people to spend more money with you by doing something that costs you nothing & takes you a few minutes! Create Graphic Packages! Create packages of graphics for certain markets, package them up and sell them at a premium price! There are literally thousands of niches out there that need graphics that you can create and sell them for 100% profit! Includes 9 Step-By-Step Tutorials That Will Make You An Expert In No Time! My Personal 100% Satisfaction Guarantee To You.. "You Save Or We Pay Promise"
This is probably the most financially beneficial offer that you could ever find. Heck, if all you did was grab my 3D Cover Action Script package and create ONE set of graphics with it, you've already paid for the package and saved about 100 bucks! But I want to take it a step further. 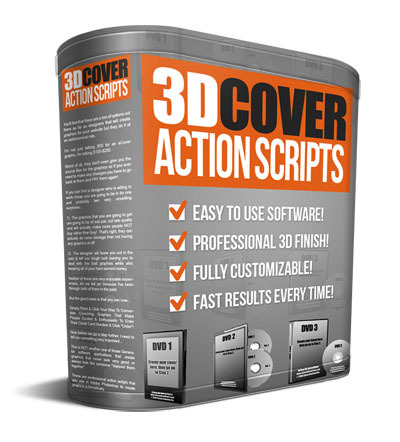 Grab the 3D Cover Action Script package. If you don't agree that it's one of the most money saving purchases you've EVER made in your online business, I don't want your money. Just open a support ticket and I will get your refund issued within 48 hours (even on the weekends). Your happiness and satisfaction is the most important thing here and I will do whatever it takes to make sure that you are both happy and satisfied or you get your money back. Now grab your package and get to saving & profiting with your new action scripts! Now You Can Become A Highly Regarded Guru Inside Within 24 Hours! I probably don't need to tell you that when it comes to creating wealth online, image is really everything. What I mean is that if your website looks like a 3rd grader put it together, you are going to have a very hard time getting anyone to purchase from it. Potential customers buy from people that they trust and if you're website doesn't instill trust and professionalism, they're outta there! That's why it's essential that your website have professional grade, high quality graphics that show them you're a real business that REALLY cares about them. Remember, people link the quality of your website with the quality of your product and in Internet marketing that equals ultimately the quality of the person (you) that is selling them the product. There is no faster way to create a professional, "guru" presence on the Internet than by having a website with high quality graphics. It's like wearing a nice suit and tie (or blouse & earrings for the ladies) the first time you meet a customer. It only makes sense that you have highly professional graphics to instill a feeling of trust and security when a potential customer hits your website. That's what you get with the 3D Cover Action Scripts package! Security in knowing that your customers will arrive at your website and be amazed at the quality of the business that they are looking at potentially doing business with. How Much Does The 3D Cover Action Script Package Cost? Listen, we both know that I'm not going to get rich selling these packages and that's not really the reason for me releasing them anyway. eCoverBlackPack.com is really my way of "taking action" against highly inflated graphic prices and giving YOU the right to choose whether you over pay or save your hard earned dollars. If I make a few bucks, cool. As you saw earlier in this very letter, the closest competitor of mine only offers HALF of the action scripts that we offer and he's charging $127 for a little over a dozen action scripts! Remember, I ALWAYS start off my products at an introductory price which allows my existing customers, existing subscribers and friends & associates to get in on it at a cheaper price. We are going to give you all 20 action scripts, full video training, personal support, so much more for the meager price of just $27! You can probably do the math as to how incredible deal that is compared to the cost of hiring a graphic designer or even just looking at the action script package of my closest competitor! 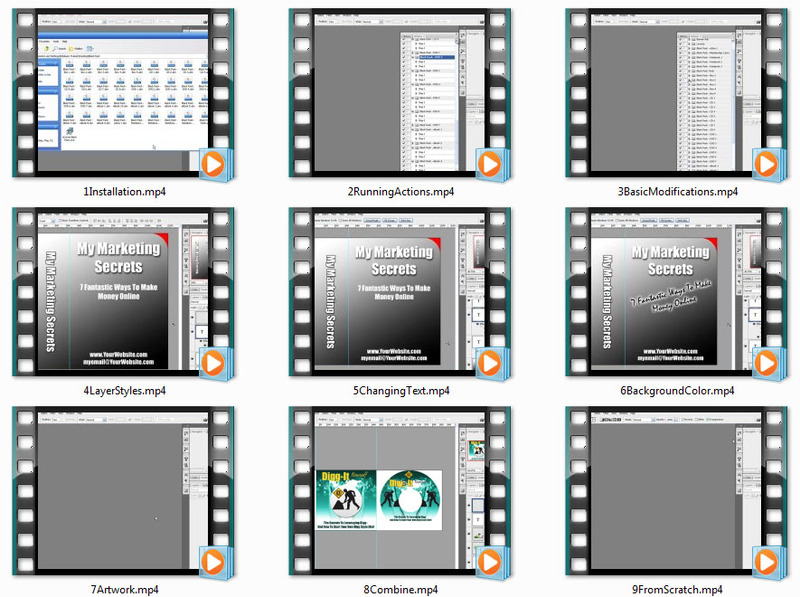 You get the entire package loaded with every action script, tool, video and training resource that you could ever need to create hot graphics. You can create as many graphics as you want for as many websites as you want for life! You also have the ability to create and SELL graphics to other people for additional income if you would like to do so! Don't miss out on this incredible package or the introductory pricing! YES Charles! I understand that I will be getting access to '3D Cover Action Scripts' straight after payment and will be able to download my graphic scripts right away! YES! Charles I understand that these graphics will increase my conversion rates and take my business to the next level! YES! Charles I also understand that if I'm not happy with the course or still can't make more money from using it, I can simply ask for a refund even 60 days from now! I can't stress enough how important it is for you to get this package right this second. This package is all about SAVING money so do it on two levels! 1) Save tens of thousands of dollars on graphics for your business, websites and any other online business need you have. 2) Save on the purchase of this package as well by being one of the limited few that get in on the introductory pricing. Secure your order now and start making beautiful graphics that sell and make money!